The fourth winter at the lake the water froze solid before a single flake fell and we nervously looked out onto a shining, black glass canvas. The ice appeared to be about half a foot thick but you could still see moving water in some places below the ice floor. 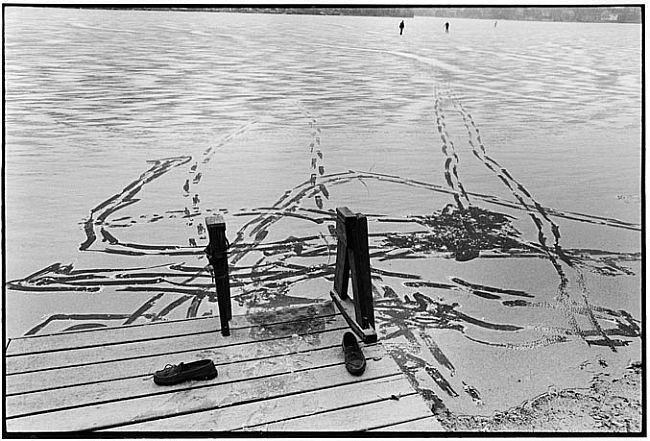 The ice cracked and cried out as we stamped our boots down on the shoreline and listened to a chorus of vibrations that scared us back onto the dock. It was difficult to tell if the sounds were warning or welcoming us. All night long the lake moaned a sad and melancholy song. I got up and crept down to the kitchen so I could watch it in the moonlight as I listened to it groan. The sounds were guttural and eerie as the ice, I later learned, was expanding and thickening. The sounds are accentuated in the early morning and late afternoon when the outside temperature is fluctuating. The next day I saw a child skating on the lake in great looping circles. I had my answer, it was safe to skate. We made hot chocolate and lugged our thermoses, skates and extra socks down to the dock. Initially we stayed close to shore before we brazenly skimmed over a sheet of black ice that was so beautiful I felt guilty about laying tracks of skate blades across the top. You could see frozen bubbles just underneath the surface and my son often chose to lie down on the ice and stare into the abyss. Rob ditched the skates, preferring to walk across the ice taking pictures. My daughter and I skated restlessly to the other side and as we turned around we had to remind ourselves that we hadn’t just skated through water and it was safe to return. There is a feeling of endless freedom accompanied with open lake skating. 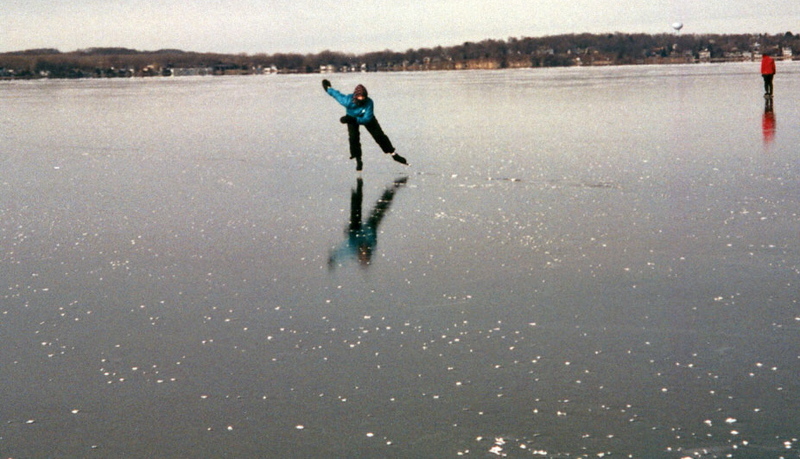 I had grown up skating on a similar sized pond called Butler Lake in Libertyville, Illinois. 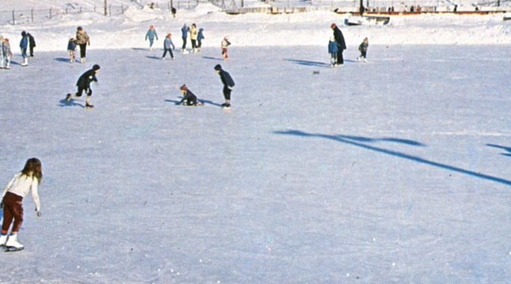 I remember the thrill of the opening day of skating. The town managed the safety of the ice and hung up warning signs if the ice ever grew too thin. Libertyville maintained a small warming house that sold cheap snacks and pumped WLS radio through a set of loudspeakers attached to the outside of the house and facing the lake. My mother used to drop us off for the day during winter vacation from school and no matter how low the temperature plunged we couldn’t leave until she was good and ready to pick us up. One bitter cold day the warming house was packed with kids like us, each hesitant to give up their seat on the bench. My older sister bargained for me to go buy the hot cocoas. I stared at the endless line of shivering children in wobbly skate blades waiting for a surly high school boy to serve them while he flirted with a cluster of overly zealous girls. I sighed and took my place in line. I returned quite a bit later with two partially filled Styrofoam cups that had sloshed down around the cuffs of my snow jacket. My seat was filled by an oversized middle school boy in hockey skates and knee pads. My sister looked at me with one of those “what do you expect me to do?” looks. So I teetered in my skates on the thick rubber mats that ran through the aisles and sipped at the chocolate flavored hot water and wished the day would end. Out of boredom and the increasing din in the warming house we dressed back up in our hats and scarves and ventured out onto the ice for short bursts. Just long enough to not freeze to death. The ramp down to the ice had a metal railing that you clung to for dear life hoping one of the hockey boys didn’t plow you down before you cleared the path. After about five minutes of limb numbing exercise we pulled ourselves back up the ramp, our frozen fingers barely clinging to the metal rail. By the time our mother arrived it was almost dark and most of the other children had left. We stuffed ourselves into the back of the station wagon and our silence confirmed to her that we’d had a great day. She obviously had. In actuality we did have fun at Butler Lake over the years but the area you were allowed to skate on was cordoned off and if you ventured too far out someone skated after you with a bull horn and made an example of you. “Hey kid, you in the stocking cap,” he announced to every turned head on the rink. “Whatya want to die out there?” You’d nonchalantly pull off your stocking cap and skate back looking at your toe grips hoping you could blend back in. 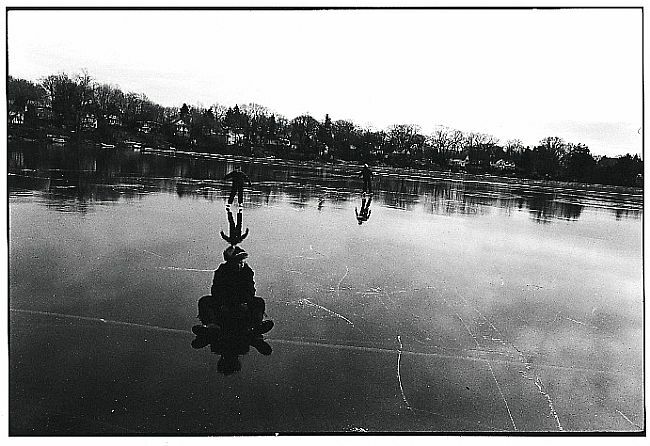 My memory of the color of the ice on Butler Lake was always a dull grey, never the jet black color that spread out in front of us that winter or the expanse of a rink that was as big as the lake was long. Butler Lake may have called out long heart wrenching cries of expanding ice but any sounds it produced were drowned out by Larry Lujak playing songs like “Harper Valley P.T.A.” or “Little Green Apples.” You expect to hear these things at an indoor rink even today but out on a lake you should just be listening to the ice speaking. 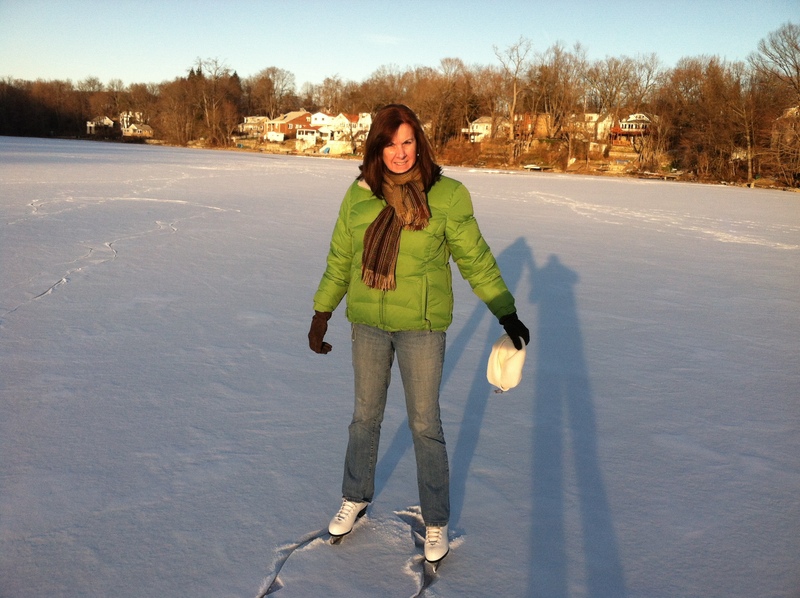 Last winter, my children grown, I skated alone on my lake through a thin crust of snow and watched the late day shadows grow long. A lost seagull was circling above me, both of us inadvertently moving to the song of the ice beneath us. I am ending this blog post with a link to silentlistening that has posted a recording of ice sounds. Enjoy.